The age-old war of juicers versus blenders is more heated now than it ever was and now we are going to discuss how you can use a blender for juicing. The reason perhaps for this trend is the fact, that the world is slowly waking up to the positive effect juices and smoothies have on our health. We have come across some juicers that do not leave any fibers for us to consume or are just so expensive that we cannot buy them. Affordability is one major reason why some people prefer to have a blender instead of a juicer. An apple a day keeps the doctor away but nowadays who has the time to cut an apple and eat it. Juice is what people prefer these days, because it is an easy way to consume nutrition. Electronic appliances are getting costly with every passing day. Buying a good juicer is not very economical and it might not fit into everyone’s budget. Blender is a good replacement for juicers as it is cheaper than a juicer and way more easy to use than a juicer. Blenders can really be useful as a juicer, if one knows what kind of fruits can be blended in such an appliance. 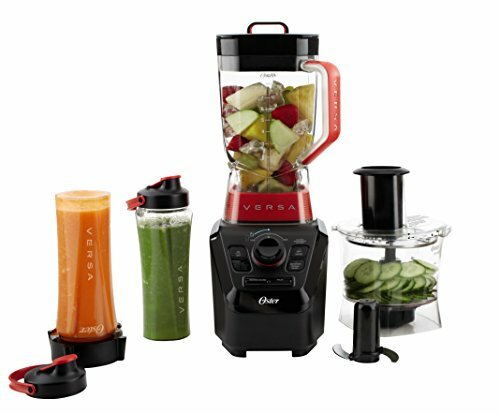 What Is The Best Blender For Juicing? How to Use a Blender as a Juicer: A Guide? 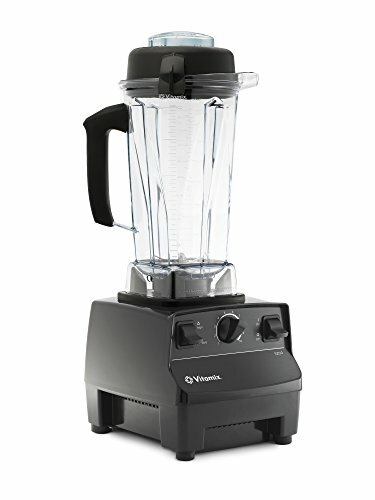 What are some of the most popular blender brands? Choosing a perfect blender for juicing can be frustrating. There are so many reviews, so many products and so many features. In the end, you as a consumer are left with a hard decision to make. This article features the best blenders available for juicing. In the end, we will take some time to declare which blender is the winner on this whole list. The Oster BLSTVB-103-000 is a budget blender that won’t disappoint you. It combines a blender, a food processor and makes pretty good smoothies. It has a powerful 1100-watt motor which has no problems going through ice, grinding nuts and more. And all this happens in a flash. One thing that makes this blender different is the patented reversing blades. They can alternate spinning forwards and backwards. The manufacturer claims this is to ensure that you get the best results every time. It has two pre programmed speed settings to help you easily decide which speed will work best on a certain type of food. It also comes with a dial you can use to control speed. The addition of a purse control is a bonus. The design is excellent and it might go a long way in impressing your friends. Though you will only see plastic on the outside, the inside is made of steel. So you can bet it will put up with some abuse. Proving this is the 7-year warranty. The Oster BLSTVB-103-000 is stable sitting on a kitchen table. There is no need to keep it in place with your hands because there is no movement even at the highest speed. Cleaning is easy like you would expect from a modern day blender. The only drawback is that the jars might present problems in terms of storage. There is no way to nest them together to save space. But at this price, this should not be a problem. The machine is worth every penny. With the same design as NutriBullet we reviewed on number 4, this one is also sleek. You will not have a problem putting it on your kitchen table because it looks impressive. Its compact design makes storage very easy. But at the same time, the small size means you will not be able to put too much in there. Otherwise, you will put a lot of stress on the blades and could break them. Unlike the other NutriBullet, this comes with a less powerful motor, running at 600 watts. But you will find it capable of blending even the hardest foods with ease. It can start and finish the whole job in under 15 seconds. So it is suitable if you do not have much time but want to make a quick smoothie. However, it comes with a warning to not run the unit for more than one minute. Somebody tried it and they burnt the motor. If you know you have a big family and cannot afford blending in batches, I suggest you look elsewhere. But it is suitable if you use it to make blends for a person or two. Like its brother, it only runs at a single speed. There is no other control apart from the on/off switch. One thing you will love is the easy operation. Additionally, it is so easy to clean. All parts are dishwasher safe except for the base and blades. This one comes with a miller blade for dry ingredients, its brother does not. This is necessary if you plan on blending dry ingredients. Breville enters the chart with the BBL605XL. To begin with, powering it is a 750-watt motor. This is of course less powerful than other blenders we have reviewed here. But it is its design that makes up for it. The Breville BBL605XL uses innovative technology that makes this blender one of the easiest to operate. Its hemisphere bowl and blading system pulls food floating on top to the bottom and forces food at the bottom of the jug to go up. This ensures that you have an even and consistent blend. You will notice the result is absolutely perfect than other blenders. To ensure quality results from each ingredient, you have the ability to control speed. This is a 5 speed machine. Additionally, it has preprogrammed speed settings that will eliminate the need for guesswork. Adding to the fun is a timer that counts on speed settings and is also a useful indicator in preprogrammed speeds. As if that is not enough, the inclusion of illuminated buttons makes reading easy. It is so much fun using this blender, the kids will definitely love it. You can tell that the designers spent some time building this unit because it looks great. When using it, it is very stable that you will not want to hold it with your hand to prevent it from tipping over. It is compact so you will not have a hard time storing it. Cleaning is again very easy like you do on most modern blenders. Noise levels are again relatively low. The only thing you might not like is the plastic jar. Many blenders come with glass jars. Others also complain that the jug is smaller so and might be a problem if you have a big family. Overall, this is a great machine and you will not be disappointed with it. The Vitamix 5200 is highly rated by consumers, and it is not difficult to see why. You will be disappointed though if you are looking for something elegant the moment you open the box. There is nothing fancy about the look of the Vitamix 5200. No one will blame you for thinking it belongs in the laboratory. The Vitamix 5200 has a powerful 2 peak horsepower motor. It is so fast and does not have any problems with hard ingredients. The blend is consistent and smooth. If you have ever used another blender before, you will not have a hard time noticing the quality of smoothies from this machine. A constant problem with blenders is that they come with small containers. This forces you to blend your ingredients in batches. Not only is this time wasting, but it can also be tiresome. You will appreciate how big the jug is in the Vitamix 5200. It is a lifesaver if you have a large family. Another issue is the necessity to remove all kinds of parts when it’s time for cleaning. Thankfully, this blender has a few parts and the blades are mounted on the base. This makes cleaning simple. All you need to do is pour in soapy water and turn on the machine. After a few minutes, get lid off the water and that’s it. The unit is solidly built. I believe it can survive a few falls. And to prove that it is a machine built to last, it comes with a 7-year guarantee. Other useful features include the pusher and the speed control capabilities. The Vitamix 5200 is available in black, white and red. Included in the box is a recipe book. If on a budget and looking for a personal blender, the Bella 13984 has got you covered. At first glance, you would be fooled into thinking this is a NutriBullet. They look almost similar. The Bella uses a 700-watt motor and I am glad to say at this price, this could be the best blender your money can get. The blades used are efficient at doing their job. There are two blades specifically, an emulsifying blade and a grinding blade. They are capable of producing quality blends that rival blends you can get from more expensive blenders. It runs at a single speed and you are out of luck if you were planning on blending at varying speeds. It comes with 5 tumblers of two distinct sizes which can easily fit in many cars. You will love this if you are always on the go. There is a single switch on the whole unit for turning it on and off. Cleaning is so easy and some parts are dishwasher safe. It comes with lids you can use to cover your drinks. It is compact that storage will not be a problem even if you have the smallest kitchen on the planet. The two-year warranty is again very comforting. If you are on a budget and you do not have a problem making drinks just for yourself, you might want to check this out. 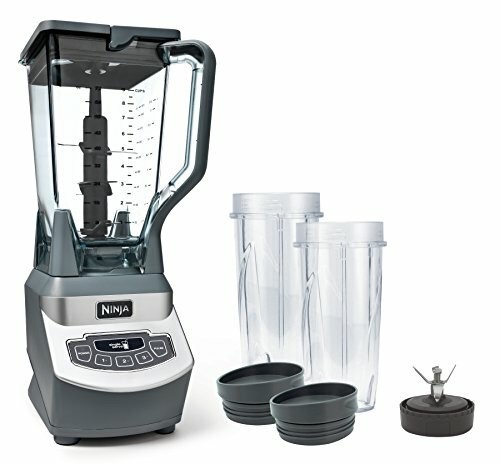 The Ninja BL740 is another good blender capable of handling most juicing tasks. It is advertised as perfect for ice crushing, blending, pureeing and controlled processing. 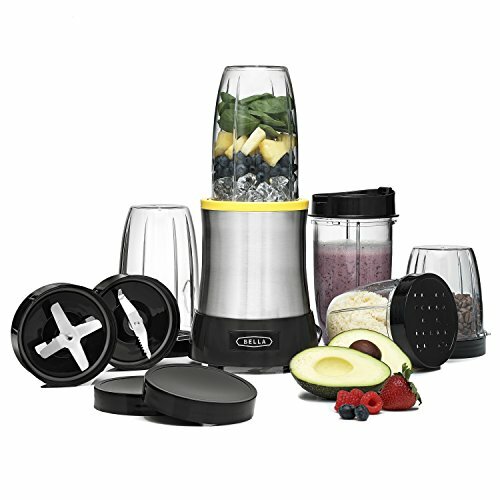 With its 1100-watt motor, it is fast and you will be making smoothies in seconds. It works great at crushing ice, turning it into snow in just a matter of seconds. When it comes to making drinks, the quality is not as good as other pricier blenders. But considering its price, this is understandable. It is however really good at making fruit smoothies. You will be disappointed though when making drinks from leafy vegetables. The Ninja BL740 has super sharp blades that require careful handling. It runs at three speeds and comes with a pulse function. The design is stylish and it would go head to head in that regard with other elegant blenders. It feels solid that you will feel free using it daily. It comes with a 72 oz jar and will be enough to make drinks for the whole family. If you are constantly on the go, the single serve cups will be handy. You can make smoothies just for yourself to take on the road. There is a blade specifically for this purpose. This machine makes considerable noise as the 1100-watt motor is pretty powerful. But you will love it for being easy to clean. What is amazing about the Hamilton Beach 58148A are the price and its attractive design. These two combined can tempt you into buying this blender. It is powered by a 700w-watt motor and it comes with 12 blending functions. Another cool feature is its wave action system. This is meant to prevent food from floating. It sounds like a great feature on paper as floating is a big problem. Unfortunately, I had a hard time proving this in action. The glass jar is a nice thing to have as these do not produce odor like their plastic counterparts. 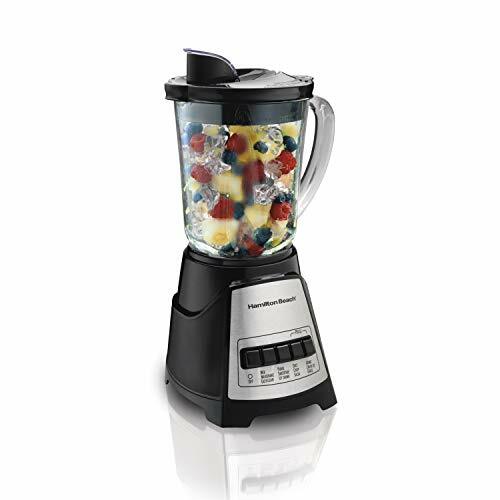 The Hamilton Beach 58148A is great for making simple smoothies. You will notice that it has a hard time working on thick smoothies. Leafy vegetables have also proved to be a no-go zone for this blender. It also does not process dry ingredients. The manufacturer advises that you should add some water for best results. The Hamilton Beach 58148A makes a considerable amount of noise. It is not very sturdy when operating and you need to use hands for it to stay in place. Another thing you will find worrying is that the unit is entirely made of plastic. Some parts feel like they could break after a few days of use. But you will be happy to know that the blender comes with a 3-year warranty. Unlike other cheap blenders, cleaning is easy. All you need to do is pour some warm water into the jar. If you have a detergent, you can also add it. You then put the jar on the base and run it for a few seconds after which you can rinse it and let it dry. This would make a very good blender for someone who is just getting started or for those who do not make smoothies often. If looking for something fancy, the NutriBullet will surely hook you will its sleek design. As a matter of fact, I think it is the most beautiful machine on this whole list. 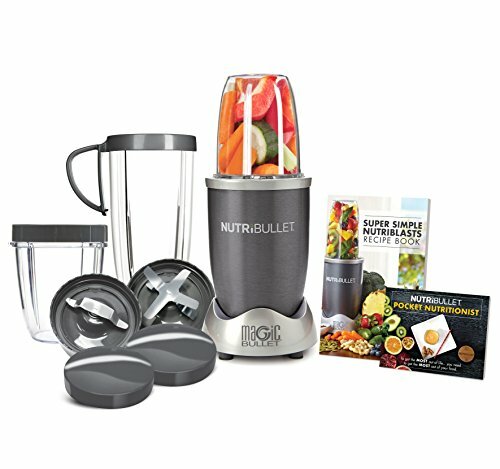 It comes with a powerful 900-watt motor which is an upgrade of the original NutriBullet which has a 600-watt motor. It is fast at blending ingredients and it is easy to use. You just have to fill the cup with food, close the lid, flip the cup over and mount it on the base. Unlike other blenders, this one can only run at a single speed. The only switch on the unit is the on/off switch. This makes it easy to operate and makes it look a less messy. However, this is where the problem starts. There is no way to respond by adjusting speed when the need for that arises. Another problem is the small capacity cups. They cannot hold large amounts of food so would need to make your blends in small batches. Some have reported leaking of ingredients when you place the cup on the motor. You can counter this by avoiding overfilling the cup. Additionally, overfilling has been linked to breaking the blades. This makes the NutriBullet Pro 900 ideal as a personal blender. You will love the easy operation and fast speed. More goodies include its lightweight design and easy cleaning. It comes with a number of cups which will make taking your drinks on the road easy. The first thing to note is the attractive design but it comes with a 1200 watt motor with 1.5 horsepower. This slices even the hardest foods and produces a smooth blend in a flash. You will be able to make your juices and smoothies faster and easily. And since this is not a juicer, you will need to add some water to get a consistent smoothie. This machine will blend, crush, puree and act as a food processor all in one. The only drawback is none of those jobs are done perfectly, jack of all trades but master of none. Another annoyance is the blades. They are not attached to the blender so can fall out when pouring out your drink. This is so irritating and can potentially result in injury. Adding to the insult is the absence of a feed chute. So when processing your food, you have to stop the machine, open it and add the food. With a 1200 watt, the machine is noisy and fails to be quite as a ninja. However, there is no need for complaints when price is put into perspective. Though it appears that shortcuts were taken to arrive at the final product, the blender delivers outstanding value. It also comes with other features like a 72 ounce pitcher with pour spout, smart speed technology, speed controls and easy cleaning though the blades can be a bit of a problem. Many refer to it as a VitaMax clone. But the Oster Versa is a machine of its own. It comes with a powerful 1400-watt motor. The blades can spin at 28000 rpm. This is so powerful that it produces smoothies even from the hardest foods and it does this in a snap. You will notice that foods might be hotter after some activity in the blender. This is a result of high-speed rotation of the blades. To make things even easier, it comes with 3 pre programmed speed settings that require you choose among smoothies, dips/spreads or soup. This lets the machine set the speed and time to turn off. Guesswork is removed and it helps you have great results every time. Adding to this is the variable switch you can use to adjust the speed for a consistent blend. You can tell from the elegant look that the designers spent a great deal of time designing. To back up their product, the manufacturer gives a 7-year warranty. The Versa is lighter than its big competitor, the Vitamix. With the blades spinning at 28000 rpm, the Versa makes considerable noise. It comes with a 64-ounce BPA-free Tritan jar, 2 recipe books and a tamper. Cleaning is a breeze and the blender is suitable for everyday use. 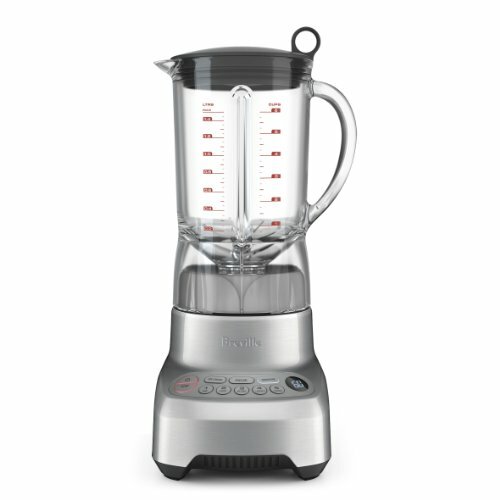 In regard to price, this is a good blender and it represents the best value for money. That was surely one long list that looked at the best blenders for juicing. As we saw in the article, each blender has its pluses and minuses. So it is not easy to simply say “this is the best blender.” But still, we have to choose a winner. The main focus is on having the best quality juice every time and from every ingredient, easy operation and durability. And only one blender fits that definition well, the VitaMix 5200. Price aside, this is the best blender you can have for juicing. It is capable of running daily without any problems. Those with big families will find the big jar just suitable. If you have the money and are serious about blending, look no further because this beast was made to fulfill your goals. It may seem like a daunting task to use a blender as a juicer at first, but millions of people have been doing this over the years and it is as good an appliance for juicing as a juicer is. In the beginning, it may need some getting used to, to be able to juice properly in a blender. The right place to start is to keep your blender at a place that it is always accessible at, and make sure it is assembled correctly so that it is available for operating swiftly when you need it to. All the soft fruits such as pears, peaches, grapes, and oranges can be juiced in a blender very easily. A blender provides you with the choice that you want to drink your juice pulp free or you want it pulpy. This fibrous pulp is however, an integral part of juices because it contains fibers that can help you keep you feeling full for a longer period during the day. This negates the need to keep on consuming unhealthy calories and thus inviting a host of diseases. The steps that are involved in using a blender as a juicer are very easy, and within 7 steps your healthy glass rich in Phytonutrients will be ready! Wash the fruit carefully with water, it is obvious that you should simple wash them under running water and rinse thoroughly. Some people opt for different kinds of soaps available in the market claiming to wash your fruits and vegetables better, they must know that these soaps leave a residue on the surface of your greens, making them unhealthy to consume. Remove all the seeds and unwanted parts of the fruit, which can affect the taste of the juice or make it, taste bad. Some fruits have seeds, that when blended together with the fruit leave a tart taste, making the whole process futile. Put the nicely chopped small pieces of fruit in the jar and ad some purified water in it. water makes the bulk of the juice while, the fruit adds nutrition. In some cases you might want to use some fruits with characteristic fragrance and taste with your green leafy vegetables to make the juice more desirable to your children. The smaller you can piece the fruits, the better its juice will be in a blender considering that blenders are not that great with huge pieces. When you have ensures that fruits are cut to apt sized pieces, the blender will have to work less and in turn provides a great consistency of juice. This step varies with the preference of people and how much they value their fiber intake. If you like, your juice minus the fiber, you need to separate the juice from all the pulp where a mesh strainer or a cheesecloth will be very handy. These can be used to separate the liquid from pulp. Now your glass of nutrition in the form of juice is ready to be served and if one likes it chilled, the juice can be stored in fridge and served later. There is always this confusion in everyone’s mind weather juices are better or smoothies, which one is a better drink for health, which is a better way of consuming fruits? Therefore, here is the answer: both juices and smoothies play a very helpful role in providing nutrition and like everything else in this world, nothing is better than the other is; it is just your perspective that makes it. Juicing is a process, which extracts all the water and useful nutrients from the fruit and all the indigestible fibers and other things are discarded from the final product that is juice. Whereas on the other hand smoothies contain all the parts of the fruit, be it the skin of the fruit or the fibers. Smoothies are generally thick in consistency as compared to the juices, because the fibers that are discarded from the juice are still present in a smoothie. Juices are helpful for the people who have a sensitive digestive system and the ones who have problem in digesting fibers. Fresh juices are squeezed from nicely ripened fruits, which act as healers and detoxifiers because they are full of nutrients and helps in restoring the body on cellular level. However, consuming only juices as diet can be somewhat problematic for one’s health. Juices can also, because a rapid spike in blood sugar, which is of some consequence in the diabetic population. This increased level of blood sugar can cause mood swings and many other memory problems. When blended the fibers of fruits and vegetables are broken down which makes them easy to digest. Smoothies release the nutrients slowly and evenly in blood stream, which avoids the rapid spike in blood sugar level. Smoothies tend to be more hunger satisfying, reason being the presence of the fibers. On the other hand, people who have only juice in their breakfast are more likely to get hungry again soon. Smoothies are easy and faster to prepare as compared to juices because for making a juice, the fruit has to be chopped , the skin has to be removed, seeds have to be removed where as in a smoothie, none of the above has to be done. By adding more fibers to your smoothie, you can make it more healthy and fulfilling for your body. To buy a great quality blender one needs to conduct thorough market research. However, you need not go through all that trouble, as we have outlined some of the best blenders to buy in a budget. These blenders offer a mix of power and functionality and are affordable at the same time. Breville manufactures the best juicers and blenders, keeping in mind the needs of its consumers. It is available in variety of sizes and volumes but the best seller is the 6Kg model, with a 1.5L glass jar. It is available in power versions of 650 to 1200 watts, based on what your budget allows. It is however, not that great at blending green leafy vegetables. Vitamix is the blender of choice for those who can afford to shell out more. Available in 5kg model, with 2L glass jar, it is available in 1000-1200 watts power. It is much taller than the one manufactured by Breville and is more functional too. They are available at about 150-200 Euros, making them quite inexpensive for the sheer usability that they offer. It is one of the most preferred brands when it comes to a blender. It is priced at about 230-250 Euros, and is expensive compared to the beginning range models. The container for the blender is made of sturdy glass and is available in a variety of colors. It is a powerful blender, but then Vitamix offers more power in a lesser budget. With a price of about 100 Euros, it is one of the best value for money blenders available in these times. Available in 3kg model, it has a choice of glass containers you can choose from. You can also choose to buy one specially tailor made to be carried when traveling, to soothe those craving taste buds on the go.